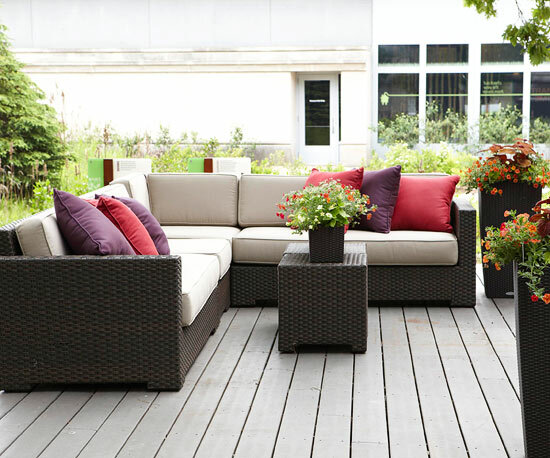 A new deck is an opportunity to extend your living room outdoors. 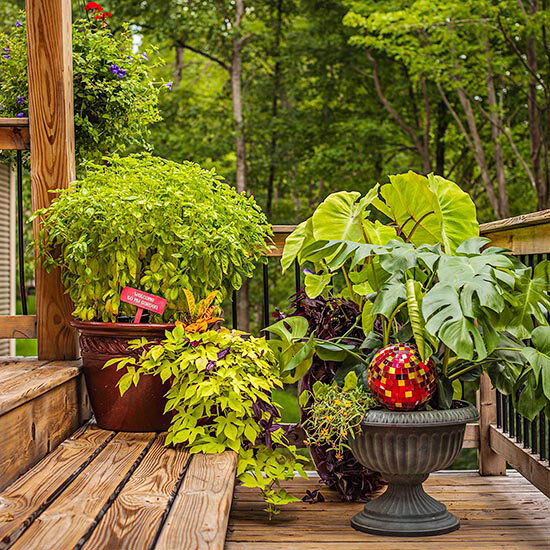 But before you plan and build a deck, read these helpful tips about deck materials, maintenance, and amenities to determine the best design for your home. Trying to save money with low-quality screws is one of the biggest mistakes you can make when building a deck. Low-quality screws will corrode, discoloring your deck and shortening its life, particularly with pressure-treated wood. (Even if your decking is not pressure-treated, it will be attached to pressure-treated beams and joists.) When old decks get rickety, it’s often due to failing fasteners, not the wood. 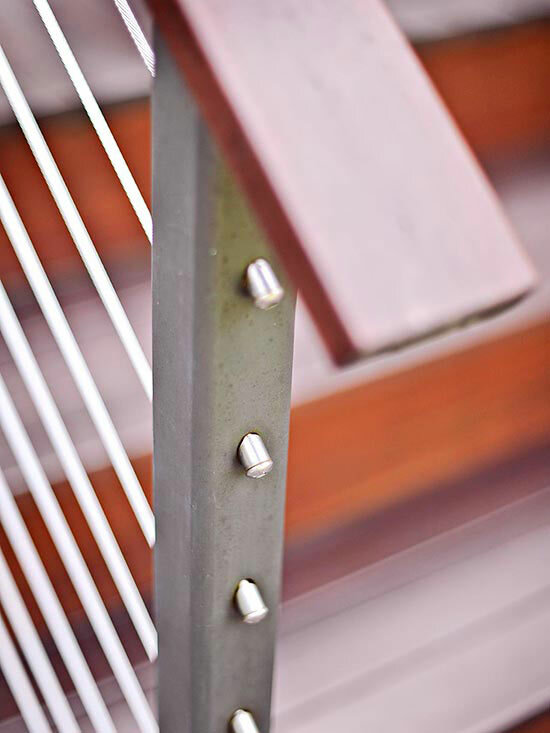 Stainless-steel or coated screws, specifically made for pressure-treated wood, will resist corrosion and extend your deck’s life. 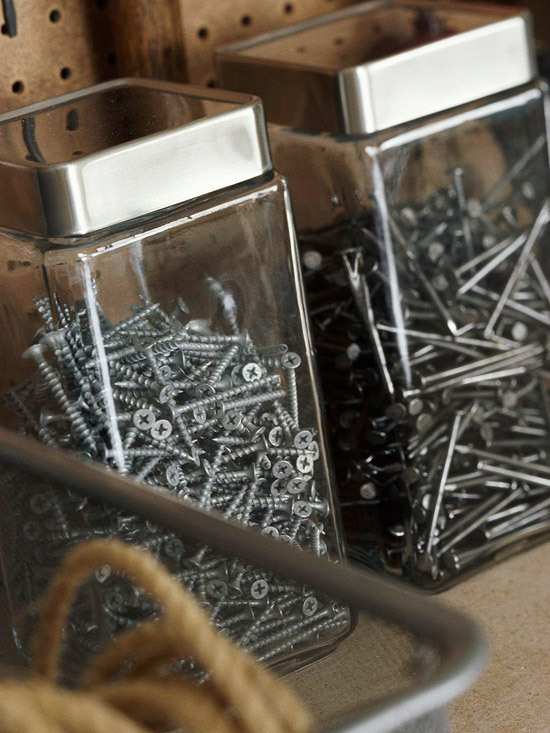 Electroplate-galvanized screws, though widely used, are not acceptable for decks. Many people don’t mind seeing screwheads on their decks, but if you’re not one of them, you have some options. Hidden fasteners leave your deck surface with a clean, simple appearance. Check with your materials supplier or a deck builder to see what options are available. 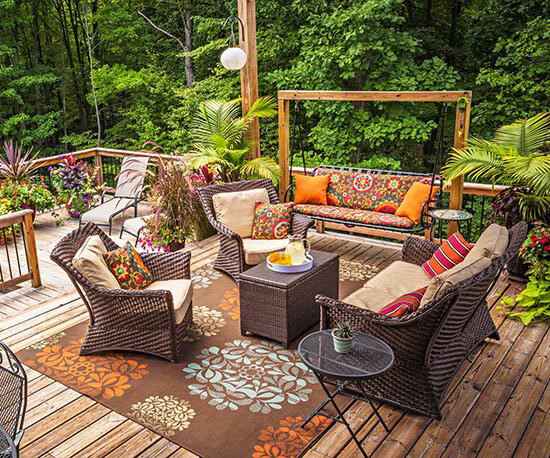 Homeowners have more decking choices than ever before. For fans of real wood, pressure-treated cedar, and redwood are good, traditional choices. But hardwoods are coming into vogue, and several choices are available, such as ipe and jarrah. Their longevity puts them in a league with composites, and they offer a luxurious, rich appearance you can’t get with other decking. They are more expensive than most other woods, however. For those searching for something different, composite decking and other synthetic materials such as vinyl are revolutionizing the industry. These products are as close to maintenance-free as you can get, and they last decades. They cost more than most wood, but the payback comes with reduced maintenance (this means no refinishing). The look is very different from real wood, so personal taste is a big part of the decision to use composites or other synthetic decking. Need more room? Don’t just build a bigger platform. Instead, construct two or three levels. They’ll allow party guests to congregate in small groups and provide cozier settings for relaxation. A second level not only multiplies your living and entertaining space, it can be used to break up the long and unattractive flight of stairs found on many elevated decks. 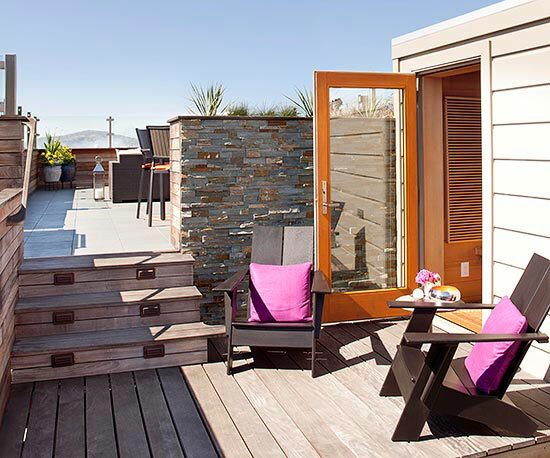 Innovative railings have taken deck design to new levels. With choices such as glass, metal, vinyl, composites, and cabling, alternatives to wood railing can have a tremendous impact on the look of your deck. One alternative to railing is stairs that run the width of one or more sides of your deck. 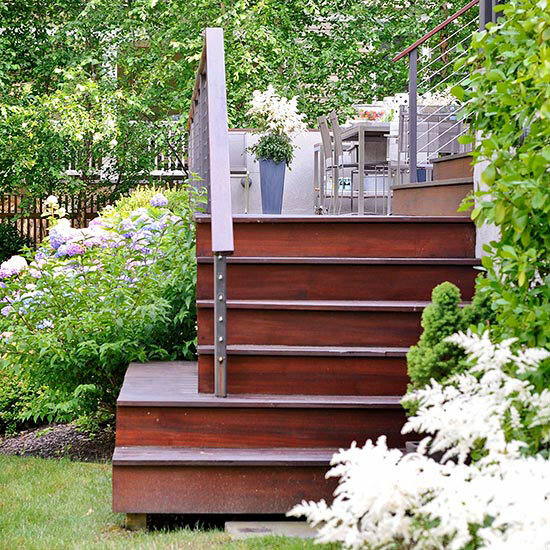 It won’t feel like a cage, and wide stairs provide an elegant transition into the yard and generous seating. Most homeowners carefully coordinate the color scheme of their homes’ exteriors, yet many don’t even consider a decking color other than brown. With today’s selection of stains and decking, it’s easy to find one that complements your home’s exterior, regardless of palette. 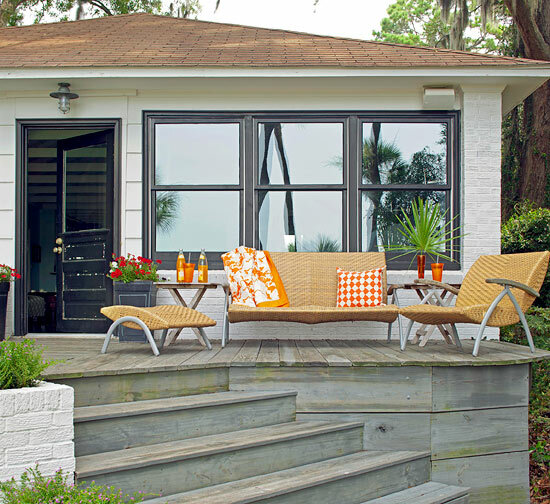 The right shades can mean the difference between a deck that looks like a stuck-on foreign object and one that’s a natural extension of your home. A pergola can dramatically transform your deck from a two-dimensional platform into a three-dimensional outdoor room. Not only does it provide shade, it gives you a place to attach speakers, lights, fans, and hanging plants–the comforts that turn a deck into a wonderful outdoor retreat. A basic pergola doesn’t cost much to add to an existing deck, but it’s easier to build as an integral part form the outset. 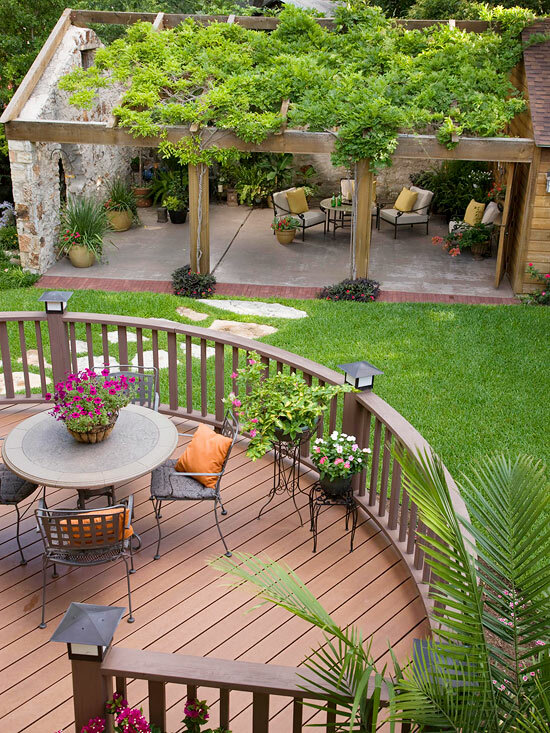 Consider a deck with unusual angles or even curves. 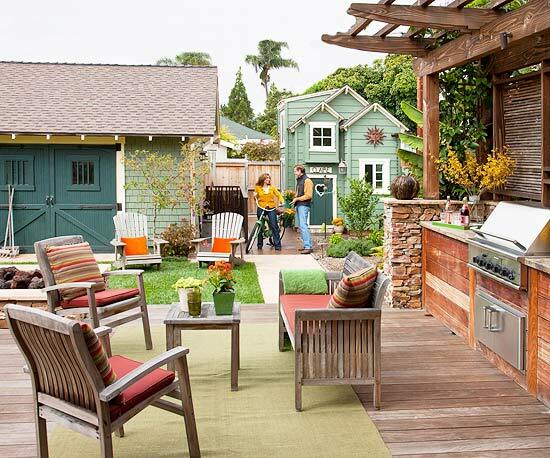 It requires more labor, but it can turn a common rectangular deck into a unique architectural feature. 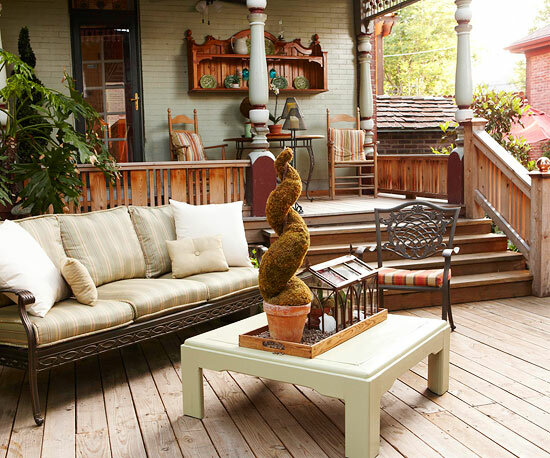 Small touches make your deck a relaxing place to hang out. Lighting, a sound system, planters, a fan, perhaps a built-in bench or two–these niceties turn a drab deck into a desirable destination. Think about these amenities when you plan your deck, rather than forcing them in after you’re finished building. During construction, you can hide wires and attach structures with relative ease. I didn’t realize that low quality screws could discolor your deck. That is good to know because my dad is building a deck, but always chooses the cheapest of everything. I will make sure to have him buy for quality, not just price, to make his deck last longer.